Distance 472nm. I received a warning that this was substantially greater than the GC distance of 360nm The SID heading NE towards the Atlantic before turning south then SW seemed bizarre for a 31L departure when there's a westerly SID. So I decided to see if I could plan a better route. I came up with this stil with a 31L departure. Total distance 389nm. It looks to be valid but I'm no expert so I'll defer to those who know better. The other point was the cruise level. 18000ft on the original changed to 320 after I entered 310 as the minimum. My plan resulted in a cruise of FL400. 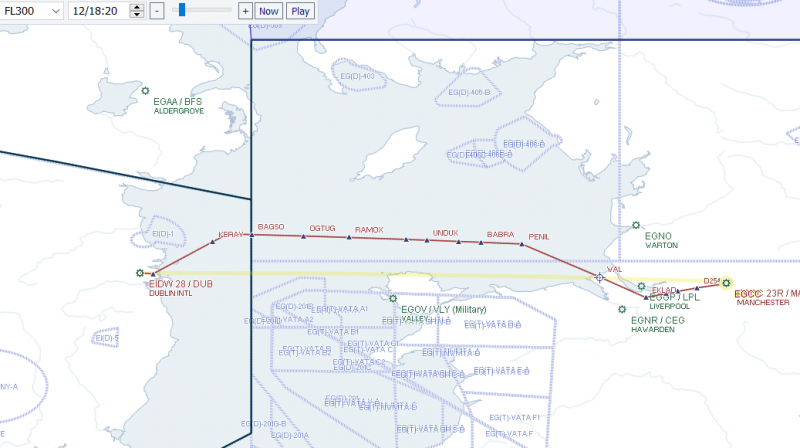 There may well be reasons PFPX chose the route it did but if it replicates the real world I can't imagine airlines being impressed at all the extra fuel they have to carry. this is what I have gotten from KBOS to KIAD using an A320 at a ZFW of 58t and everything else left unchanged. The distance of this route is 445NM using runways 04R in KBOS and 01R in KIAD. I don't know if those would be realistic departure/arrival runways at those airport, so forgive me if they are not. They were automatically selected by PFPX. I assume you are on an up-to-date AIRAC and RAD and have not made any special selections such as "do not use directs", right? Maybe your PFPX looked at the winddata and wanted to fly lower or something like this? Looking at the windcharts it seems the wind is almost 70kt stronger at FL350 than it would be at FL200. I have seen a couple of cases already where even the real LIDO flight planning software that my airline uses wanted to keep us below FL250 because of the wind. And often it may actually make sense. Have you tried to compute both to see if there's actually any gain from going that low? Thanks for your reply. If you've just planned that maybe the winds have shifted. PFPX definitely gave me 31L. I flew a B738 with a ZFW of 110,600 pounds. AIRAC data is 1902 so up to date. Not sure what RAD is. The winds were calm ar KIAD so I chose 18C. I'm no expert on this route which is why I rely on PFPX. Use Directs was unchecked. I get a similar output to Emanuel which conforms to the FAA preferred routes. Runway 33L assigned with AS historic weather ( KBOS 121154Z 33008KT 10SM FEW050 SCT110 BKN250 M07/M19 A3050 RMK AO2 SLP328 T10721189 11044 21072 51008), PFPX assigned FL300 with significant headwinds which were stronger at higher altitudes. Something are weird, there's not a RWY 18C at KIAD, RWY 19C maybe? Given others are getting better routing than me is there a way of resetting PFPX back to default settings in case something is messing up the routing? Can we check that 31L was indeed an error also Ray so as to rule out an AIRAC error. What was the exact method used to find the route ? I've just planned it again with a departure time of 18:00UT. Departure runway is now 04L and arrival 01R. But chosen SID is LIBSTA6. Why doesn't it select REVSS4 which is a westerley departure? @Emanuel Hagen, yours seems a far better routing with the STAR being picked up at BIGGO. Why is my routing so different to yours and Stephen's? I typed in my flight number followed by KBOS and then KIAD. 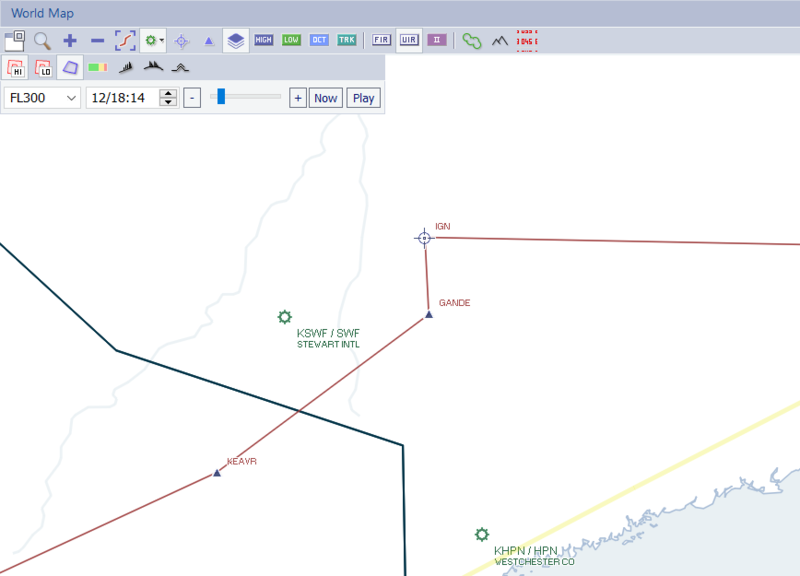 I left PFPX to determine the runways based on winds. I have a current Wx subscription in PFPX and in the status bar WX:Online was ticked. I then use the Wizard to go through the remainder of the action. Aircraft Database, Random Loading, Find Route, Find Alternates, Compute Flight, Release Flight. This is part of the route decided by PFPX. 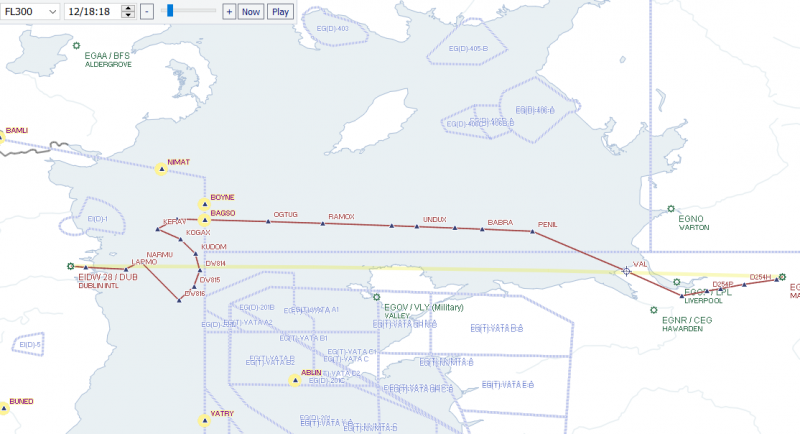 How on earth is an aircraft meant to navigate such a routing? Here's another example of a poorly selected STAR. First using the one selected by PFPX - BAGS1L on EGCC-EIDW. Then I selected BAGS1K which seems far more suitable and realistic. So why didn't PFPX chose BAGS1K? Sorry, but this program has some problems that need sorting out. I saw another post with odd routing and the user was directed to install the RAD restrictions file. I've done that and there's good news and bad news. Stephen, it strikes me that this RAD file is more or less essential to get correct routing. Rather than users having to install the various files and folders manually doesn't it deserve its own installer? Or better still, integrate it into PFPX and Navigraph so it's updated automatically with each AIRAC cycle. Is the file updated each AIRAC cycle? If so that's an awful lot of work for the user to do. A comment from the developer might be useful here too. I am afraid I can not really help you with the technical PFPX issue, but I can help you with the above one. Dublin airport actually requires pilots to plan the L arrivals as they are usually used during peak arrival hours. What they usually do is to clear the L arrivals and then you fly that point merge procedure until it's your turn which is when they clear you direct to the FAF. For planning purposes the L arrivals are to be used though. My company, for quite some time, used to plan the K arrivals to save on the trip fuel but pilots always took at least 10min extra to cover up for the expected delay so we had to change this recently now to the recommended L arrivals. Thanks for clearing up that mystery Emanuel. At least I have control over STARs so can choose the better one for my flights. There is an issue where a SID is not assigned on a few routes where it should. The BLLZR4 departure would be used here but the LOGAN 2 serves multiple departure routes, however as this is a fully vectored departure it is not included in the NG AIRAC. There is no data source for Free Route Airspace available to the community, it is not even possible to identify the intersection types eg. Entry / EXIT/ INTERMEDIATE / ARRIVAL / DEPARTURE. Thankfully David has undertaken to produce the RAD restrictions and Directs files without commitment and without recompense. To do this for a published AIRAC date is something else altogether and would require early AIRAC data access in addition. Any user can create these links using the 'User Waypoints & Airways' editor and in addition a add/delete or update a RAD entry, that in itself is another strength of the product. I'm sure the data exists commercially but is highly likely to fall outside any figure the majority of the community would pay for. Thanks for your reply. It seems PFPX is quite reliant on David. I notice there is a link to his file in the Downloads section but perhaps this needs greater prominance. I'll set a reminder to download the new files each AIRAC cycle. It's disappointing his files cannot be integrated into a Navigraph AIRAC update. I would challenge your claim that "any user can create these links". Surely a level of knowledge is required for that? I'm not saying that it cannot be done Ray but would take an ongoing commitment. Understood Stephen. Maybe it's something the author of PFPX should be considering.